1. Marble gift wrap give gifts a stylish and classy edge. 2. Glitter wrap is the best for you sparkle and shine friends. 4. Metallic wrapping paper gives gifts that futuristic yet fabulous addition. Christmas is a Week away and I have only purchased ONE gift - a Buxom Lipgloss set for my younger sister, however I still have people on my list that I need to purchase gifts for when Christmas is less than a week away. Here are some last minute Christmas gift ideas that I have in mind for them, and maybe you all can use them too! For my roommate I want to get her something that I know she would love but also something she would need. 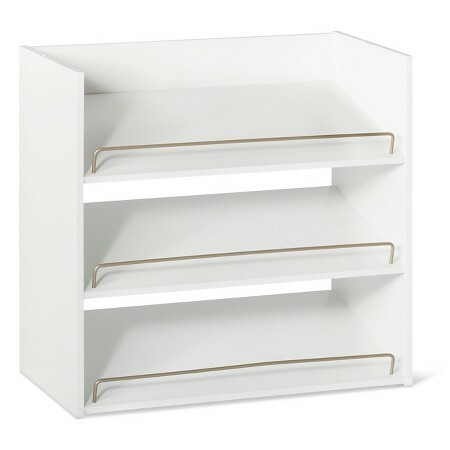 We live in a small apartment so storage can sometimes be an issue, so I will probably get her something storage related like this awesome shoe rack from Target. The simple design of the rack will allow it to coordinate with any decor, and since its a shoe rack it will allow her to keep her shoes more organized. For the best friend I usually try to get something that has sedimental meaning for the both of us, however running short on time makes that task a little harder. This year I'm going to get her the Dr Jart. Masking All The Way set from Sephora. This will allow my best friend to treat herself to a at hope spa day with the option of 7 different masks! For the work bestie I want to get her something that takes her AWAY from the work place. I would either get her something from Sephora as well, like the First Aid Beauty Winter Skin Savers set, OR a huge cozy fluffy blanket from Target. For the significant other (mine is a guy) he always says he doesn't want anything for Christmas, probably because he doesn't celebrate Christmas in the first place, but I going to get him a little something so he doesn't feel left out. I'm going to get him this simple Adidas hoodie from Urban Outfitters. Good luck with your Christmas gift hunt! It's not too late to stock up on this season's trendiest pieces. Below, we have chosen five of this winter's biggest trends that will help you beat the cold and stay fashionable. Velvet made a huge comeback this year. We are seeing this expressive texture everywhere form leggings to thigh-high boots. we love this trend because It can easily be added to an evening look or mixed into any street daytime wardrobe. There is so much velvet seen throughout that it has become one of the years top material! Metallic looks are not only for NYE. The use of Metallic silver, gold, and bronze certainly can be included in the best winter 2017 color trends. We have noticed skirts, dresses, tops, pants and everything in between appearing in silver, gold, copper and more. For winter 2017 designers have jumped into the world of felines, from pussycat prints to kitty jewelry and reworked leopard print. This trend will have you feeling fashion forward and feminine. Designers have restyled puffer jackets to the extreme with oversize padding and comfy chic detailing to stand the below zero temperatures. The puffer jacket can easily add an extra edge to any look. While this trend has made an appearance before, embroidery and lace are still a vital part of the winter 2017 fashion trends. We see this trend in turtleneck lace dresses under velvet layers and over masculine pants. We can’t deny that embroidery and lace add a beauty and elegance to any winter outfit. what do you think of these trends? which one of them is your favorite? will you be trying any of these trends for winter? So excited to have commissioned a work of art by the grand artist Mark Narens, Black Couch honoring the ten years of Latino Fashion Week a "Decade of Elegance" and featuring model Laura Silva, the face of Latino Fashion Week and one of our tops models. Latino Fashion Week is a Latino experience featuring fashion, gastronomy, entertainment and most importantly, art. I look forward to continuously bring more artists to the forefront.